Another change to the match screens in FM18 saw the old Overview screens being replaced with context specific Review Screens, however the default screens are a little lacking in detail so these mods use my Match In-Between Highlights panels to improve the data shown and add some better customization to the screens. There are three screens in total. - Added a selectable panel under this on the left where you can select various options. - Fixed the middle panel to now show the worst performers panel. - Split the right panel vertically and changed them to selectable panels with the same options as the left panel. - Tweaked the middle panel to add some more match stats at higher resolutions. - Added a split right panel with selectable panels with the same options as the left panel. - Has three panels with the right one split. - The widths of the panels can be adjusted in game to suit your needs, have also allowed the vertical split to be adjusted as it not remembering the position is less of a problem here. - Each panel is a selectable panel so you can adjust what is shown from the drop-downs and like with the IBH panel you can further customize by edting the xml files. - Added the score and kit bar to the Dual Player Ratings panel. - Also added a best/worst performers panel. When installing if you are asked if you want to overwrite any files if they have the 'ibh' bit in their name you can say no as it shares files with my IBH mod but I've included the files so you don't need to use that mod if you don't want to. NOTE: I haven't tested this with the Touch Mode, but it uses the same files so it should work with that mode as well though some options might not be available. 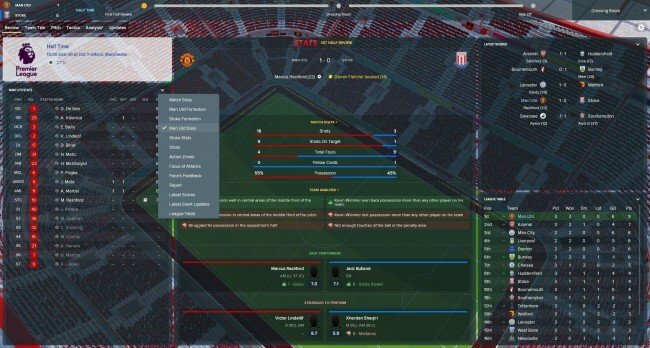 For the Post Match Review Screen you can also adjust the width/height of the panels in game by dragging the dividing line. For the other screens you'll need to see the advanced instructions below. 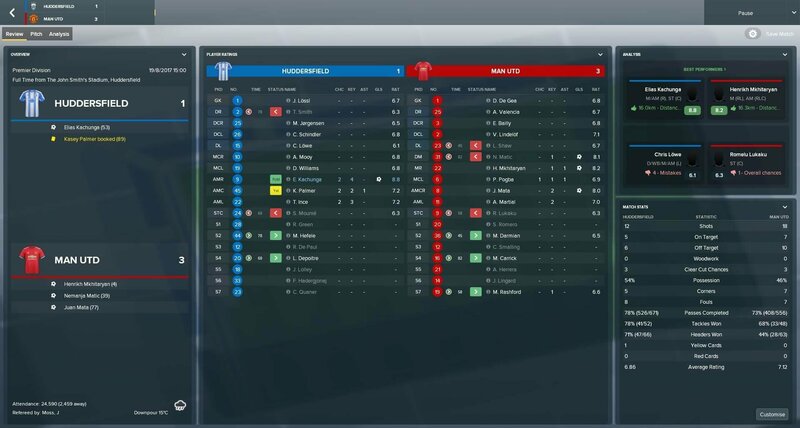 If you want to change the appearance of the content that appears in the individual menus then you will need to follow the Advanced instructions, which are the same as the Match In-Between Highlights Mod. You just need to edit the 'match in between highlights panel review' xml file instead. 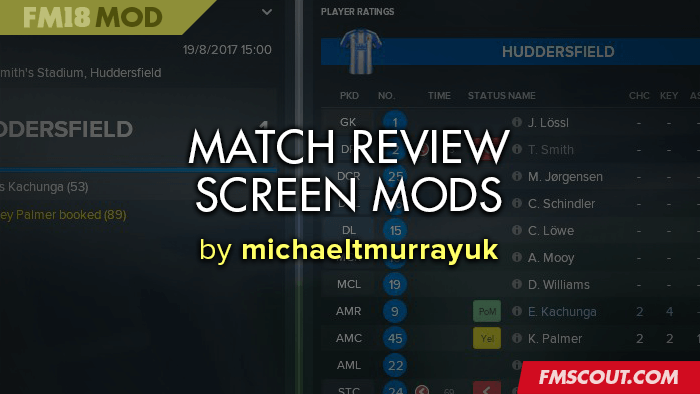 For the Half-Time and Full-Time Review Screens I haven't included the extra views in the files, but if you want them you can just copy over the views you want from the 'match in between highlights panel review' file as the coding is the same, just remember to remove or comment out the existing code for that view. 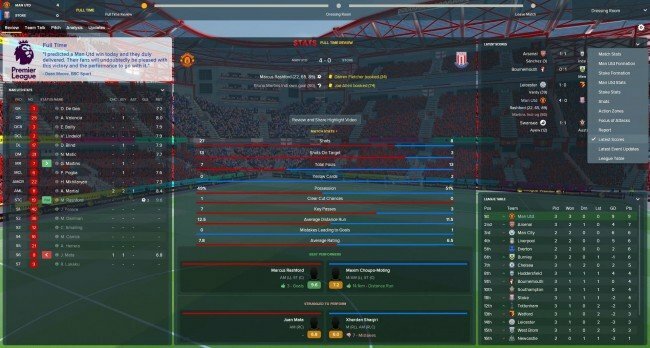 The Half-Time Review screen is controlled by the 'match mid match review panel' xml file and the Full-Time Review screen is controlled by the 'match full time review panel' xml file. For the Post Match Screen you can adjust the height/width of these panels in game. For the Half-Time and Full-Time Review Screens you'll need to follow those instructions to adjust the height/width of each panel but the coding to change each is the same and the files are commented to show you where the code for each panel is. Again these instructions are the same as for the in-Between Highlights Panel so follow the instructions from there, further as it uses the same file as the IBH panel (if you didn't overwrite the files) then any changes made their will show here automatically. Full-Time Review Screen: 'match full time review panel'xml file. Post Match Review Screen: 'match in between highlights panel review' xml file. - Fixed problem with views resetting. - Updated for patch 18.3.0 fixes problem with logos not showing.